I've just been for a walk with the dog and almost every other window has a blue light display or flashing "icicles" hanging from the gutter. None of the twinkling is coordinated with the house nearby and it's giving me a headache. Some flash so fast that I feel dizzy and almost epileptic. Multi-coloured lights look pretty and white lights look frosty and magical. Decorated houses are a bit OTT but provide much amusement and entertainment for everyone else. A couple of years ago, the odd blue light display here and there looked unusual and engaging but that bandwagon has rolled on by and everyone has jumped on it. Agree or disagree? 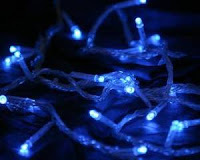 Are you one of the blue light brigade?